In my new FREE download, The Beginners Guide to Bologna, available on ItlayTravelandMore.com, I share my discoveries and insider tips on what to see and do and what and where to eat in Bologna. I believe that experiencing a destination is much more enriching than just visiting it. When I visit a destination, I search for the qualities that best express the essence of the local culture. The following is an except from the eBook. 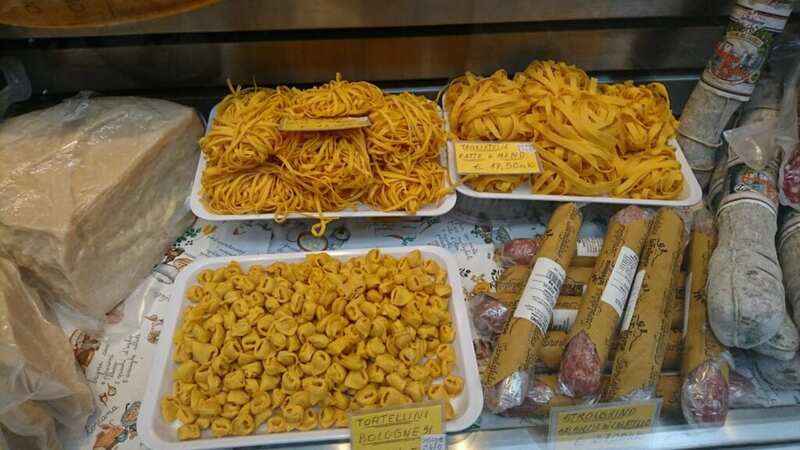 You can’t go to Bologna without trying three things: Tortellini, Tagliatelle alla Bolognese and Mortadella. Tortellini are stuffed pasta served in broth, Tagliatelle is a long pasta served with Bolognese meat and tomato sauce and Mortadella, known abroad as “boloney”, is a heat-cured pork with spices served as a cold cut. Gourmet Food district – Via Caprarie and Via Drapperie are in the heart of the city center and are lined with gourmet food shops and grocers, some of which have been there for over 100 years! Looking at the perfectly shaped, hand-made pasta is as fascinating as seeing a precious piece of artwork. Generations of tradition and knowledge has been passed down in every single noodle. Local tour operators offer food tours or cooking lessons with a local who will teach you how to cook like an Italian. Good homemade cooking just like it was made by grandma herself. Traditional dishes like tortellini in brodo (broth), tagliatelle with ragù or specialty dishes like baked green lasagna with ragù are on the menu. Pasta dishes range from 10-12 euro. The restaurant is popular, so it’s best to book in advance. A small, intimate restaurant perfect for a candlelight dinner. You can order from the menu or get a sampling of everything at a fixed price 30-45 euro. With the fixed menu of the day, the waiter brings out dish after dish, basically until you say “stop”. Tables are limited, so it’s best to book in advance. Part of the Eataly empire, the restaurant at the Star Hotels Excelsior is conveniently located near the station. The menu has traditional dishes as well as light meals for lunch.